With its keytops spread wide like fingertips the curved Franklin typewriter has a unique en unmistakable profile. 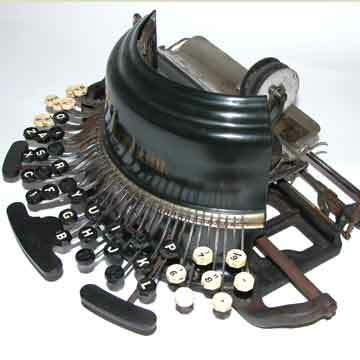 It was invented by Willington Parker Kidder, who would move on to thrust action typewriters several years later..
What was new about the Franklin was that it was the first machine to use a gear action to bring the type down on striking a key. The mechanical differences between the different Franklin models are quite small and there have been different ways to distinguish them. The machine shown here is regarded as the 'Type II' Franklin, or Model 3 or 4. The serial number of 2183 shows how few of the first Franklin model were built. That machine, decorated with an elaborate decal is extremely rare. The Type II was labeled 'The Franklin' and had a nickel-plated plate of the manufacturer in the center under the keyboard. The Type II was followed by the 'New Franklin' (or models 5 and 6).